A rapid method is described for the preparation of a highly uniform and sensitive SERS substrate by an improved ‘drop-and-dry’ method. 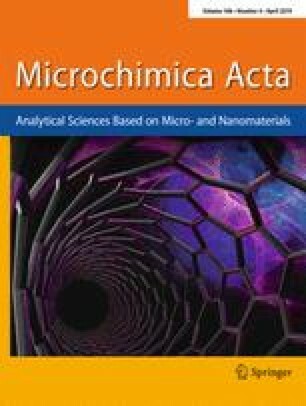 Gold nanobipyramids (Au NBPs) were prepared inside the nanoholes (nanowalls) of anodic aluminum oxide (AAO) templates with a typically 5-μm nanohole depth. The SERS substrate can be prepared by this method within 40 s and on large scale. The SERS signals obtained with this Au NBPs-AAO substrate is stronger by four-orders of magnitude compared to conventional a silicon wafer substrate. The SERS signal for dopamine (DA; measured at 1311 cm−1) is found to be enhanced by a factor of 2.2 × 108. The response to DA extends from 10 nM to 0.1 mM, and the limit of detection is 6.5 nM (at S/N = 3). The assay was applied to the determination of DA in spiked human serum. 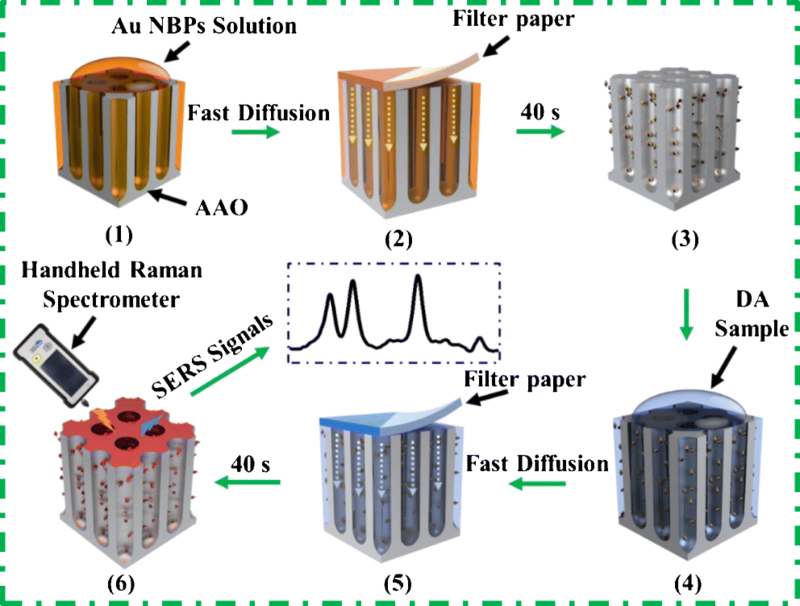 Schematic presentation of a highly active and uniform 3-dimensional substrate composed of gold nanobipyramids and anodic aluminum oxide (Au NBP/AAO). It was used for on-spot sensing of dopamine. Bingyong Lin and Jiaming Chen contributed equally to this work. The online version of this article ( https://doi.org/10.1007/s00604-019-3357-1) contains supplementary material, which is available to authorized users. This project was financially supported by the National Natural Science Foundation of China (21675028, 21575027, 21507041 and 21575025), Nature Sciences Funding of Fujian Province (2018 J01682), STS Key Project of Fujian Province (2017 T3007), the cooperative project of production and study in University of Fujian Province (2018Y4007), and the Program for Changjiang Scholars and Innovative Research Team in University (IRT_15R11).